A sneaker changes into a city, which transforms back into a sneaker and back again into a city in an endless loop. During Club Real #3 on 11 July Niketown 2 premiered, the perfected sequel of a version from 2003 that was produced in collaboration with Casco. 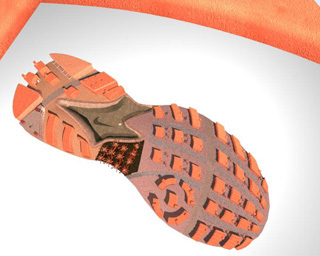 In this animation a sneaker transforms into an urban landscape ...and back into a sneaker in an endless loop. Niketown studies the turning point between different realities. 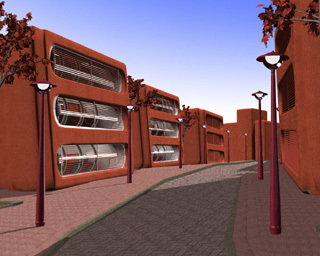 The 3D animation shows the metamorphosis of the sole of a Nike sneaker into a visionary city landscape. This crystallized end station of one system of meaning (fashion, sports) becomes a floor plan for another system of meaning (architecture, urban development). Cultural, social and historical reasons for origination are replaced by visual rhetoric. Sadouma has tested the elasticity of structures of meanings and the ability to interchange visual characteristics before. He did so by transforming a former Albert Heijn supermarket into a fully functioning mosque. What seemed to be conflicting on first sight, turned out to be a perfect synthesis. The stereotype AH plastic shopping bags became tiles, till became pulpit and Albert Heijn's logo was easily reshaped into Allah- calligraphy. Tarik Sadouma (Amsterdam, 1979) is a fine artist and studied at the Rietveld Academy in Amsterdam. He currently lives and works in Cairo. ...why not go the whole way?